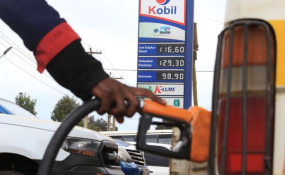 The High Court on Tuesday declined to suspend the 16 per cent VAT on petroleum products, which took effect last Saturday, despite suits by the Central Organisation for Trade Unions (Cotu) and activist Okiya Omtatah, which argued that the levy is illegal. Justice Enoch Chacha Mwita ordered Cotu and Mr Omtatah to furnish the National Treasury, the Energy Regulatory Commission (ERC), Kenya Revenue Authority (KRA) and the Attorney-General with their suit papers and return before him on Monday next week. Mr Omtatah and Cotu in their suits argue that the National Treasury, ERC and KRA have defied Parliament's intentions in levying the VAT, which lawmakers voted to suspend until September 2020. Cotu, through lawyer Okweh Achiando, argues that taxpayers may not be able to recover the amounts already collected. Mr Omtatah added that Parliament's intention was clear in voting for the suspension of the new levy. "The court, being one of the State organs, cannot afford to hide under the doctrine of judicial deference but [it has] to listen to the voice of the people of Kenya and their cries brought about by the operationalisation of the VAT charge. The people of Kenya who live below the poverty line cannot, in the economic circumstances, afford the tax levied," Cotu boss Francis Atwoli says in suit papers.